This is the last week with Stuart Baxter as a coach considering that starting on July 1st, Eric Tinkler takes over. It’s going to be a very interesting time for SuperSport United fans, so get ready to use this bet9ja bonus to place your bets. Don’t miss this opportunity to bet on your favourite team or against it, if you feel they’re not up to the task. On Tuesday, they faced TP Mazembe. The two teams have met earlier this month and the result was a 2-2 tie. The former New Zealand striker Brockie said the team made sure to keep the ball away from the best players of Mazembe in order to throw them off their game. Let’s see if they managed to do the same this time. SuperSport played Williams, Kekana, Bhasera Gould, Daniels, Mokoena, Modiba, Phala, Grobler, Mnyamane and Letsholonyane. The team tried to maintain their top spot in Group D of the Confederation Cup by winning against Mazembe at the Lucas Moripe Stadium in Atteridgeville. SuperSport doesn’t have any more games in the Confederation Cup this week, but the South African Cup final approaches fast. Baxter has to focus his attention on Saturday’s match against Orlando Pirates. Last time SuperSport faced the Pirates, the game ended in a 1-1 draw. The first half was uneventful but after the break, SuperSport scored first in the 54th min followed by the Pirates about 20 minutes later. However, on November 1st, 2016, the Pirates lost 6-1 against SuperSport United. This was a great victory for SuperSport and a shameful defeat for Orlando Pirates. Jeremy Brockie, the top scorer in the Confederation Cup with 7 goals, admits that difficult to play both Mazembe and the Pirates within 5 days but he’s confident that the game against Mazembe is good for them before the South African Cup final. The clubs that finish first and second in the Group ranking advance to the quarter finals. Before this game, SuperSport, Mazembe and Horoya of Guinea had 5 points each while Mounanan of Gabon had none, with half the matches of Group D played. In the meantime, Horoya faced Mounana and won, thus taking the lead with 8 points. After the match between SuperSport United and Mazembe, things changed a bit. 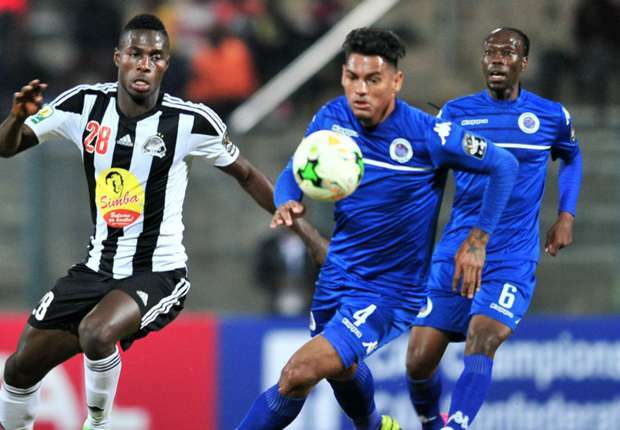 The game ended in a 1-1 tie thus giving both SuperSport and Mazembe 1 point each. Kingston Nhkatha and Bradley Allan Grobler received a yellow card. The current Group D top is Horoya (8 points), SuperSport (6 points), Mazembe (6 points) and Mounana (0 points), each with 4 games played. In Group A, Rivers United and FUS Rabat occupy the first 2 places with 6 points each, but Rivers has 4 games played while Rabat has only 3. So, let’s see how this goes after Rabat faces Africain. In Group B, Sfaxien (6 points) and MC Alger (5 points) are at the top with only 3 games played. Libolo and Zesco United lead Group C with 6 points each and 4 games played. After the South African Cup final from Saturday, SuperSport United must shift again their focus toward the CAF. They will be facing Horoya on June 30. It looks like the teams on the top 2 positions in Group D will have a showdown. Stay tuned to find out who wins and don’t forget to place your bets. Be the first to comment on "Important week for SuperSport United"